Online outlet for a large fashion label, with tie-in to their back-end warehouse system. A bespoke XML-based e-commerce engine specific to the needs of clothing retail underlies a highly visual Flash front-end, developed in association with Elevated. Won Macromedia Site of the Day. Completed May 2004. MDLF is a not-for-profit organisation that funds independent press in emerging countries. This project, currently under development, is to allow MDLF to build online, multilingual surveys with summary reporting. For more info about MDLF, see their website. I have developed an open source implementation of IAPWS steam properties, and a computational fluid dynamics (CFD) computation-queuing system, as well as various other pieces of modelling code in C++ and PHP as part of my PhD, ongoing. This add-on to the popular PHP unit-testing framework SimpleTest gives SimpleTest the ability to test applications which have integrated email functionality, for example double opt-in systems. I developed this accounting software for MDLF along with another of their programmers in 2003, using PHP, PostgreSQL, ADODB, Apache SSL, and a rapid application development that is still under development. 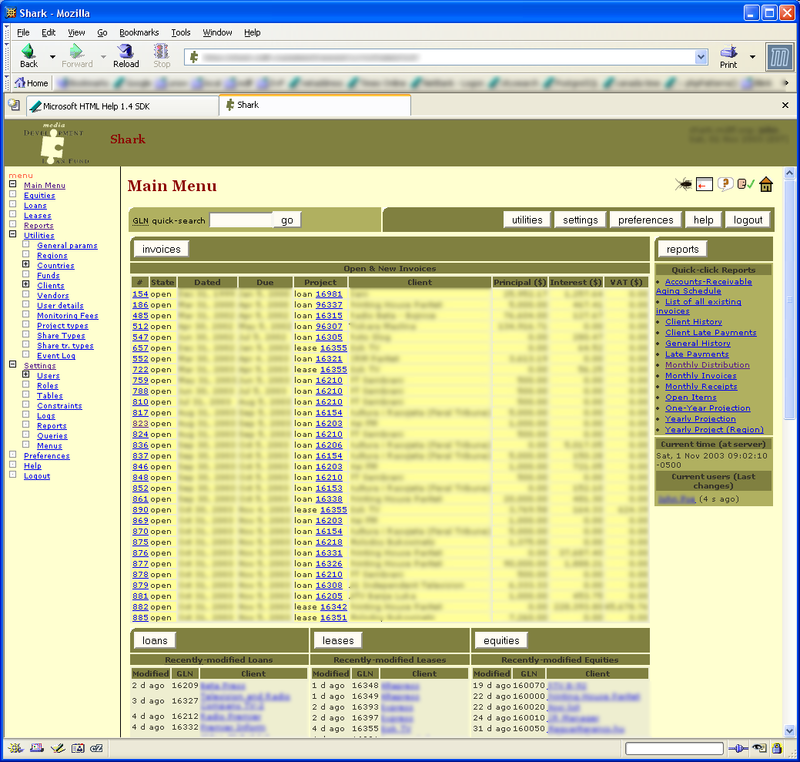 A report generation engine is a part of it, and creates reports in HTML and PDF formats. Designed this brochure website for a London media consultancy run by a couple of good-natured irish chancers in 2002. I developed the online store for MDLF in 2002. Publications which MDLF supports are often unable to obtain merchant accounts, so MDLF provides this as part of their services. I was chief developer for a visual arts industry website for the people who create ZOO Quarterly. Unfortunately they are no longer around. Developed from launch in Cold Fusion, to include online photography folios, webcams, editorial, interviews, etc. The fantastic web design was by James Goggin. 2000-2001. A proposal for a brochure website created for a local airfield in the UK. 2000. A proposal for an architect's website in Sevilla, Spain. 2000. Concept for an online sandwich bar in Dublin. 2000.